India's 16th ranked Sameer Verma was one happy man in the USD150,000 Syed Modi International Badminton Championships which ended in Lucknow, India on Sunday. It was a double celebration for the Indian who not only retained his title in the championships but more importantly, he garnered enough points to book his place for the season-ending HSBC BWF World Tour Finals in Guangzhou, China. The World Tour Finals offers USD1.5 million in prize money and will be held in the Chinese city from Dec 12-16. Third seed Sameer, however, was staring at defeat in the final against China's sixth seed Lu Guangzu after losing the first game 16-21. However, with the home fans cheering him on the Indian forced a decider by taking the second game 21-19 and finished off Guangzu in the third game with a 21-14 win after an epic 70-minute battle. 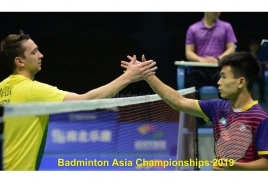 Sameer's win also lifted the gloom in the Indian camp after their men's doubles hope Satwiksairaj Rankireddy, the No 8 seeds fell to Indonesian fourth seeds and 7th ranked Fajar Alfian-Muhammad Rian Ardianto in straight games 11-21, 20-22 in the final. There was more disappointment for India when former world number one Saina Nehwal slumped to a shock defeat in the women's singled final. The second-seeded Nehwal ranked nine, went down tamely 18-21, 8-21 to China's fourth seed Han Yue. It was a sad day for India in the finals as they also lost the women's doubles final when Ashwini Ponnappa-N. Sikki Reddy failed to raise their game and went down to Malaysia's Chow Mei Kuan-Lee Meng Yean 15-21, 21-13 in 42 minutes. It was the first World Tour title for the third-seeded Malaysians, ranked No 19, who finished runners-up in the Russian Open in Vladivostok in July. China won two titles in Lucknow. Apart from the women's singles, China also won the mixed doubles through Ou Xuanyi-Feng Xueying who upset fourth seeds Rinov Rivaldy-Pitha Haningtyas Mentari of Indonesia 22-20, 21-10 in the final.